My dear friend Jordan and her family were in town from Virginia to visit relatives (also my dear friends) and she brought her kids out to visit The Farm. Max, her 4 year old son, had seen and enjoyed chickens before at another farm close to their home, and was terribly excited about the prospect of seeing (and chasing) more chickens. When they arrived, I explained to Max that my chickens were very friendly and didn't need to be chased, but if he was very slow-moving and sweet to them, he might get to pet one up close. I also was anxious to show him our friendly sheep. The only thing more fun than playing with sheep myself is watching a child discover sheep for the first time. Oh my. After some initial reticence, Max decided he really liked the sheep and would someday like to own some. And one will be green. And one will be flat. I'm not sure what that looks like in his mind, but he's very clear about it. Max is deliberate and well-spoken--way beyond his years. We also went to see the alpacas, but since they are not as interested in being touched, Max asked if he could go back and see the sheep again. He was really very brave when you consider that Shadrach is almost as tall as Max, and probably outweighs him twice over. 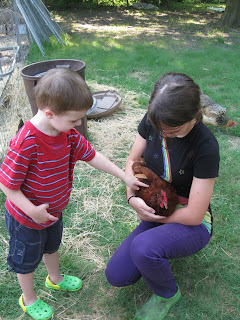 To satisfy his original interest, Emma held a chicken for him to touch. Come back soon, Max. Next time I'll teach you all about the joys of cleaning stalls. Absolutely adorable! He's going to make a fine farm hand one day! 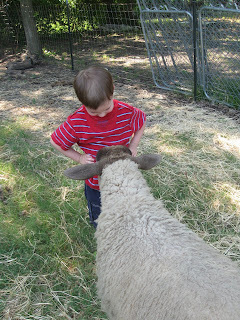 How sweet--he looks like me when I first met the sheep. :O) I'm sure there are many things that make life on the farm worthwhile--this certainly has to be one of them. Awwhh! Little guy! I love how kids minds work! Flat sheep....hmmm. You could loose them if they stand sidways! Oh, so cute! I am glad he was able to pet them. Those pictures are priceless! Sounds like you had a great time with them.